The most significant threat associated with grey squirrels is the spread and transmission of a disease called squirrelpox virus (SQPV). The grey squirrels carry the disease with no harmful effects to them. 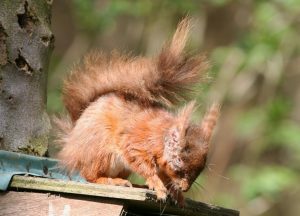 It can take only one grey squirrel to introduce this virus to a local population of red squirrels and then the virus can spread throughout the reds with devastating effect. 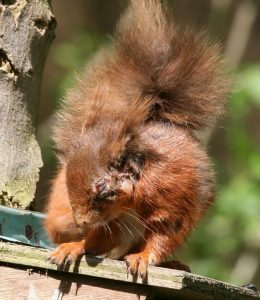 For more information on the disease or about what to do if you find an infected red squirrel go to the RSNE information sheet. An injectable vaccine has been developed which in laboratory testing is effective against squirrel pox. 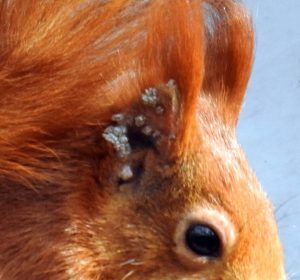 Further work is required to develop a method of administering an oral vaccine to red squirrels in the wild. This could potentially be an invaluable conservation tool. For more information click here. Red squirrels are susceptible to other diseases and illness aside from SQPV. Adenovirus is a relatively recently identified threat, and its impact on wild populations is still not fully understood. It is an enteric virus, therefore reds show no outward signs of the disease, however animals are often found dead. Current research by the AHVLA is continuing to shed light on the impacts of this disease as studies continue to identify confirmed cases. There is growing evidence that this disease may be introduced by rodents such as mice and rats, especially in the case of reds in captivity. For more information click here.